Theater J’s new initiative is dedicated to preserving and reviving the forgotten literature of the Yiddish Theater. Join us as directors and playwrights uncover and re-interpret nearly-forgotten Yiddish classics in new English language readings, workshops, commissions, and eventually productions. March 13 – April 7, 2019, Theater J presents the first full production of the Yiddish Theater Lab: The Jewish Queen Lear. Details are here. 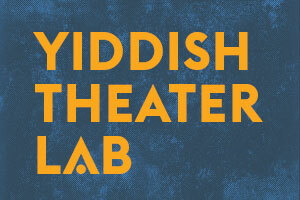 The Yiddish Theater Lab is supported by The Marinus and Minna B. Koster Foundation, The Chaim Schwartz Foundation, The Leshowitz Family Foundation, Terry Singer, and Elaine Reuben. A feisty young woman, caught in a love triangle between the highbred son of her employer and a poor but adoring klezmer-player, must decide whether to stoop for love or money. And why is stooping the only choice anyway? Set in a shtetl of romanticized memory, this heart-breaking comedy is based on the classic Yiddish play The Singer of His Sorrows by Osip Dymov. Presented in partnership with CrossCurrents Festival. Tickets: Pay-what-you-can (advance purchase encouraged). When Yankl, the town drunk and a notorious philanderer, gets married, everyone predicts that it won’t last. Everyone, that is, except Yankl’s young wife. Can her faith in him stop Yankl from falling back into his old way of life? Can people change? And if they can, is there any guarantee that they won’t change back? This sensual exploration of the power and limitations of relationships rings just as true today as it did when it was written over 100 years ago. Jacob Gordin’s masterpiece is a free adaptation of Shakespeare’s familiar classic and ushered in the first golden age of Yiddish theater in New York. It’s Purim when Reb Dovidle decides to give extravagant gifts to his daughters—but when his youngest daughter refuses the gift, he sends her away. Will Reb Dovidle follow the downward spiral of Shakespeare’s tragic King, or will he find forgiveness and redemption? Filled with characters at once archetypal and hilariously, achingly human, this classic is a fresh twist on a familiar tale. A portrait of the eternal struggle between good and evil, God, Man, and Devil is Jacob Gordin’s most famous play. With a little bit Faust and a little Book of Job, this 1920’s play begins with a debate between God and the Devil about the nature of man’s goodness. Soon, the Devil must walk among men as he tries to corrupt one good man to prove his point. Tragic and timeless, God, Man, and Devil is a cautionary tale of epic proportions. Jacob Gordin (1853 – 1909) is among the most notable Yiddish theater playwrights of the late 19th and early 20th centuries. Born in the Russian Empire, in modern-day Ukraine, Gordin immigrated to the United States in 1891 where he moved from the field of journalism to theater at the prompting of several influential friends including Yiddish theater star, Jacob Adler. Gordin was considered a reformer of the Yiddish stage because he brought he realism of writers like Anton Chekhov, Henrik Ibsen and Leo Tolstoy to Yiddish theater, intending to shift the tone of Yiddish theater from frivolous spectacle to serious drama. While many of his plays were commercially successful in his time – most notably The Jewish King Lear (1892), Mirele Efros (1897) and God, Man, and Devil (1900) – he was known for berating audiences who didn’t respond as enthusiastically to his work as he expected. “Truth is the teacher,” he once lectured an audience, “and therefore, I will continue to provide serious plays until you acquire a taste for them.” Although Gordin wrote nearly 80 plays, only a handful of them have ever been published. Explore the full range of the Yiddish theater in this collection of short plays, drawn from the rich tapestry of Yiddish theater. Performed in English translations by Yermiyahu Ahron Taub, these strange and beautiful plays take us from 19th century European town life to the tenements of the Lower East Side. S. An-ski’s Father and Son tells the story of revolutionaries and police in a Jewish town in 1905 Lithuania. Khaver-Paver’s Romeo and Juliet: A One Act Play takes us to the tenements of lower east side New York, where Dave woos Suzy from his window across the tenement alley. In Solem Ash’s With The Current, the family of a rabbinical court rabbi grapples with the younger generation seeking new forms of religious observance. And in Peretz Hirschbein’s famous Raisins and Almonds, a mysterious older woman appears at the house of Freydele Gdayle, offering unexpected gifts. Join Theater J for an evening of delightful exploration as we hear some of DC’s finest actors bring these forgotten classics to life. Starring Nancy Robinette. Yermiyaho Ahoron Taub is the author of six books of poetry, including most recently A moyz tsvishn vakldike volkn-kratsers: geklibeneYidishe lider/A Mouse Among Tottering Skyscrapers: Selected Yiddish Poems (2017). Tsugreytndik zikh tsu tantsn: naye Yisidh lider/Preparing to Dance: New Yiddish songs, a CD of nine of his Yiddish poems set to music, was released on the Multikulti Project label (www.multikulti.com) in 2014. Taub was honored by the Museum of Jewish Heritage as one of New York’s best emerging Jewish artists and has been nominated four times for a Pushcart Prize and twice for a Best of the Net award. With Ellen Cassedy, he is the recipient of the 2012 Yiddish Book Center Translation Prize for Oedipul in Brooklyn and other Stories by Blume Lempel (Mandel Vilar Press and Dryad Press, 2016). His short stories have appeared in Hamilton Stone Review, Jewish Fiction.net, The Jewish Literary Journal, Jewrotica, Penshaft: New Yiddish Writing, and Second Hand Stories Podcast, among other publications. www.yataub.net. One of the more inventive and surprising plays of the Yiddish theater, Osip Dymov’s Bronx Express tells the story of one working class Yid who dreams of something more. When he falls asleep on a New York subway, he’s shocked to meet the characters from the train car’s advertisements coming to life. With cameos from Aunt Jemima, the Nestle’s Baby and the Arrow Collar Man, this story explores the true costs of the American dream. Visiting Yiddish scholars: Nahma Sandrow and Miriam Isaacs. Osip Dymov (1878 – 1959) is the pen name used by Yosif Isidorovich Perelman, a prolific writer, journalist and Yiddish playwright. Born in the Russian Empire, in modern-day Poland, Dymov began publishing stories, plays and articles in St. Petersburg at the age of 16. Dymov adopted his pen name, taken from a character in Anton Chekhov’s short story “the Grasshopper” (1892), as a teenager and continued to use it throughout his career. In 1913, at the age of 35, Dymov immigrated to the United States at the invitation of Yiddish actor and theater director Boris Thomashefsky where he sought to improve the artistic quality of Yiddish theater. His play, The Bronx Express (1919), was so successful that it was translated into English and produced at the Astor Theatre on Broadway in 1922. Over his career, Dymov published more than 25 plays, a short story collection, a book of selected works, two volumes of memoirs, and dozens of essays and newspaper articles.